Every business office, apartment building, retail store, and school needs reliable emergency lights and exit signs for safety in the event of a power outage or fire. Fraker Fire Protection Inc. offers emergency lights and exit sign maintenance and services. We provide testing, repairing and installation services for any residential, commercial, governmental, or industrial facility in Los Angeles County, Orange County, Ventura County and the Inland Empire. Emergency lights and exit signs are crucial safety elements in a residential, commercial, or industrial building. When an emergency strikes, occupants rely on dependable lighting to safely find their way out. Adequate lighting also helps avoid panic and maintain order. Fraker Fire specializes in all types of fire protection systems in Los Angeles, including different types of fixtures and even emergency LED lighting. Not only are we your one-stop source for testing, repairing and installing fire protection systems, but our services comply with all state and local fire department requirements. All our installers and service personnel are certified by the State Fire Marshal or Contractors State License Board. Fraker Fire Protection Inc. has knowledgeable and experienced specialists who offer quality installation, testing, inspection, and repair services. OSHA Code of Federal Regulations: The Occupational Safety and Health Administration (OSHA) requires that all emergency lighting systems be working properly at all times. NFPA 70 – National Electric Code: The National Fire Protection Association (NFPA) requires specific illumination and performance of emergency lights and exit signs. They also require certain standards for battery-powered lighting systems. NFPA 101- Life Safety Code: NFPA requires monthly inspection and annual testing of all emergency lighting systems. International Fire Code: It is required that to have exits be properly illuminated and to have exit lighting systems remained illuminated for at least 60 minutes. Fraker Fire Protection Inc. has made it a priority to offer emergency lighting services in compliance to the law and other local requirements. In addition to having the right fire protection systems, it is crucial to be prepared for an emergency and have an effective escape plan. In order to be efficient during an emergency, you must have emergency lights and exit signs installed in specific locations. Our goal is to ensure that the lights and signs for emergencies are working properly. 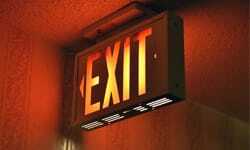 We cater our services to all types of emergency exit signs including LED signs and Self Luminous Tritium Exit Signs. We also offer installation and maintenance of emergency lighting systems that are incandescent, dual head, halogen and other types. Our lighting products and services are reliable. The Fraker Fire Protection Inc. professional technicians offer their expertise in the field for tests, repairs and installations in order to provide you with a working safety system. We are dedicated to providing high-quality emergency lighting systems as well as customer service. By having functional lighting systems, you can avoid fines and liability issues. A working and efficient emergency lighting system helps to increase the level of security and helps direct people during an emergency. Our lighting experts can assess your property to determine the exact placement of lights, exit signs, and other illuminated safety elements. We are familiar with how to properly install and wire fixtures and test them to make sure they are working. Specific regulations are in place for each structure, which we use as guidelines for industrial emergency lighting installation in Los Angeles and residential emergency lighting installation. We also closely follow local, state, and federal guidelines for installations in commercial establishments and at government agencies. We service all components of emergency lighting systems. In addition to thoroughly testing the systems we install, we can address any issue with bulbs, batteries, battery charging systems, and the functionality of security systems. Annual maintenance is strongly recommended to minimize downtime and ensure your system is online when an unexpected situation does occur. Our technicians ensure units are properly mounted, installed in the correct location, lighting is adequate for building occupancy, and bulbs are working properly. When it comes to installing emergency lighting, don’t take any guesses; allow our team to provide you with the best solutions possible at a reasonable price. There are many options on the market. The vast selection of products can be confusing, but our team is experienced with home safety and can boost the security of everything from single-family homes to high-rise condos. Emergency lighting installations can protect you and your family in the event of a fire or natural disaster, so you can quickly find your way to safety. Factories, warehouses, and other industrial facilities have unique safety requirements. There are more hazards than most other locations, so large facilities must be equipped with strong lights and visible exit signs so employees know where to go in an emergency. We specialize in serving clients in any setting. Office buildings, shopping malls, and other commercial settings require safety for all their occupants; we provide commercial emergency lighting installation in Los Angeles to satisfy all applicable regulatory requirements and maximize the safety of everyone inside. Government buildings must also be protected, which is why we’re proud to offer governmental emergency lighting installation as well. Our residential and commercial emergency lighting installation professionals are prepared to help with any sized project. Whether it’s industrial or governmental emergency lighting installation in Los Angeles, you can rely on us to install any kind of lighting fixture to do the job, including the latest in LED exit signs. Don’t wait another minute—call us at 866-560-3473 to ensure your emergency lighting is installed, properly maintained, and fully functional.